Rainscape was started in 1984 by Al Hummell, a licesend contractor, with his Bachelor of Science in Horticulture earned at Cal Poly San Luis Obispo. His goal has always been to provide not just ordinary, but extraordinary landscape solutions for you, the customer. Al and his team of 15 employees provide excellent quality workmanship to solve your landscape problems, and provide you with easy, and beautiful solutions. 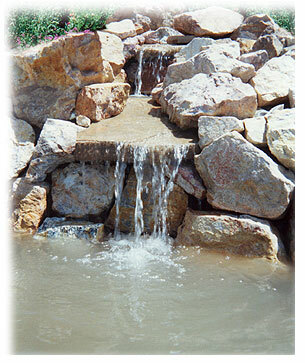 Natural boulders, rocks and gravel to create waterfalls, streams and ponds. We will work with you and advise you to achieve your unique landscaping goals. Give us a call today.